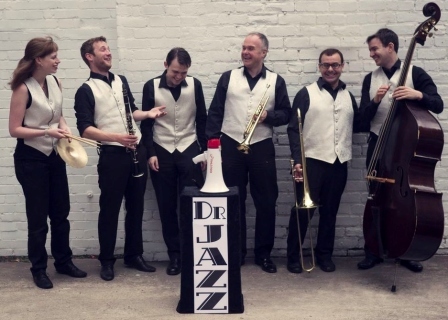 Dr Jazz is a 6-piece Roaring 20s band comprising of trumpets / vocals, trombone, clarinet / sax, piano, double bass and drums. Dr Jazz is both quirky and fun, with the vocal numbters being sung through megaphine for that authentic 1920s sound. With an extensive repertiore of instantly recognised favourites from the Roaring 20s through the Musicals of the 1930s and beyond, Dr Jazz entertainers all ages with it's mix of timeless, ever-popular songs from Broadway and Hollywood. Serving up classics by the likes of George and Ira Gershwin, Cole Porter and Irving Berlin... with a generous order of Dixie on the side! Dr Jazz can be presented in traditional waistcoats and dickie bows or full evening dress. Founded in 2006, it is a very experienced and professional band offering a top class and hassle-free service. Dr Jazz is very versatile and can provide music indoors and outdoors for weddings, drinks receptions, garden parties, dinners, balls, race meetings, corporate hospitality and charity events. "Thank you so much for playing at out party at Low Farm; it just topped off the event so wonderfully - everyone said so. I'd like to hear your Yorkshire 1920s band again if it is nearby - I'll bring the sunshine with me hopefully. Take care and best wishes to you all." "Can I please say a huge Thanks to you and the guys in Dr Jazz; you were amazing! So much so that the regional area manager is looking into booking your services on a regular basis. You really made the night for us. Thank You."